Dyspraxic thoughts of a GURPS GM, who has no time to prep! In celebration of Animay (following the lead of Total Party Thrill), this month I will be creating an anime character in GURPS every Friday. As an anime, Cowboy Bebop is often a 'gateway drug' into anime so it seemed appropriate to start the series here. Needless to say, the following may contain spoilers! Spike is a new take on the classic lone ranger archetype who is as deadly as he is unassuming. Purposefully designed to look 'uncool', when he springs into action his Jeet Kune Do flows his feet and fists into a formidable armament. When he's not kicking his way through enemies he uses a Jericho 941 pistol (or two!) with amazing accuracy, betraying his dark past as a member of the Red Dragon Syndicate. 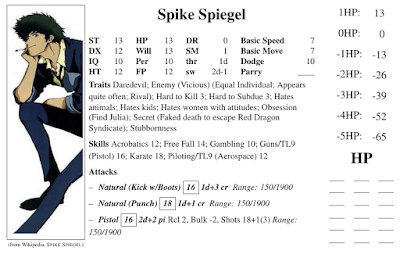 I've chosen to make him a 150 point character (with -58 in disadvantages/quirks) as this feels about right for the series; the protagonists of Cowboy Bebop are exceptional but the world itself is fairly realistic.